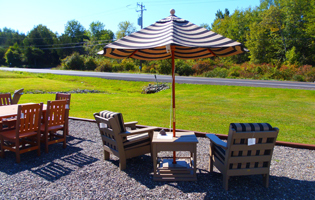 Bayhorse offers an enormous selection of Amish hand-crafted outdoor furniture. 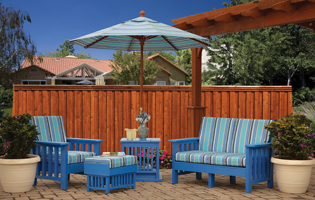 From Adirondack chairs, picnic tables and benches in wood or poly, to dining sets, pub sets, chaise lounges, even umbrellas, cushions and pillows, we have what you're looking for. 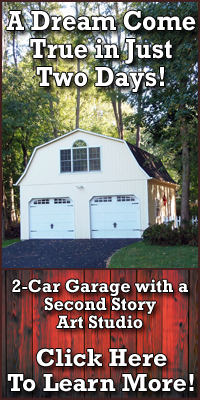 If you need something right away, take a look at our In-Stock Furniture to see what we available available on our lot. We feature the full line of custom order hand-crafted products from Patiova Furniture. 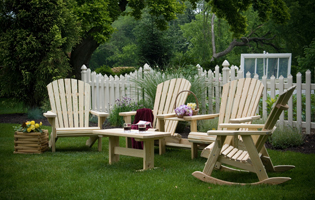 Patiova Adirondack, English Garden and Rollback furniture includes chairs, rockers, tables, lounges, swings, gliders and tête à têtes. We also offer the full line of custom order hand-crafted wood and poly furniture from Finch Furniture, including Avonlea garden seating, Garden dining, Great Bay bar tables and chairs, Great Bay dining, Keystone dining, Mission deep seating, Mission dining, Sea Aira Adirondack seating, Van Buren deep seating, wood tables and sets, picnic tables, children's furniture, pillows and seat cushions and umbrellas.